HARLEM — Tattered brown signs with weathered edges hang from the chain link fences of dozens of city-owned vacant lots throughout Harlem, hoping to tempt would-be volunteers to turn them into verdant slices of paradise. "You've found the lot of your life," read the poster-sized banners, put up by land advocacy group 596 Acres on all of the lots. "Now get the keys." Of the 77 city-owned vacant lots left in Manhattan, 69 are located in Harlem, according to a spokesman for the city's Housing Preservation Department — and 596 Acres is now turning its attention to greening them up, one by one. "It's important to live in an area that has green space, and you want to keep the neighborhood clean and green," said Harlem resident Amanda Monzon, who began volunteering for cleanup with 596 Acres after spotting the group's banner in a run-down lot near her home. 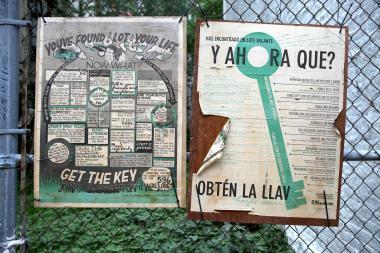 596 Acres signs for land advocacy hang over the fence of a vacant lot in Harlem. For the past two months, Monzon and a group of seven other neighbors have converted that lot — a former cement driveway at St. Nicholas Avenue near 127th Street — into a brightly painted urban green space called the St. Nicholas Miracle Garden. Monzon felt so strongly about the project, she scheduled the meetings and spearheaded the push to get permission to clean up the lot. "I just saw it as an open space," she said. The St. Nicholas Miracle Garden is the first city-owned plot in Harlem slated to be cleaned up this year through the work of 596 Acres, a Brooklyn-based group that works with communities to develop public land into shared spaces under the Parks Department's GreenThumb program. The St. Nicholas lot adds to the 13 community gardens currently located on city-owned land in Harlem's Council Districts 9, 10 and 11, according to the Parks Department. 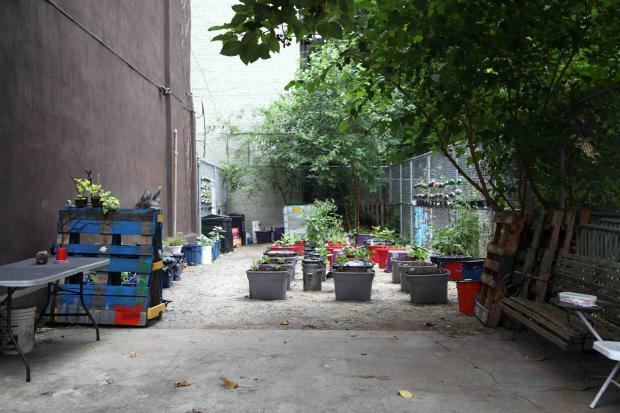 Some of the more recently added lots include the Henry H. Garden at 126 W. 134th St., the space used by local farm Harlem Grown, and the The Carrie McCracken Community Garden at St. Nicholas Avenue between 117th and 118th streets. "These lots are public land and we're trying to involve the community," said Kaitlin Dougherty, a community organizer for 596 Acres. The group, which began three years ago and was initially focused in Brooklyn, hangs up clever cleanup banners on vacant lots and tries to solicit interest from local residents near the lots. It also hosts an interactive map of the available city-owned vacant spaces on its website, prompting organizers to redirect their efforts to Harlem, given the glut of available space. 596 Acres is continuing its work across the rest of the city, including at a city-owned site on the Lower East Side, Siempre Verde, at 181 Stanton St. But its main focus remains on Harlem because of the high concentration of vacant lots owned by the city. "There's a couple lots in the Lower East Side," Dougherty said, "but there are so many in Harlem." Now that the St. Nicholas garden is under way, 596 Acres is looking for its next vacant lot project, which it will need approval to complete through the GreenThumbs program. HPD took over lots after the city acquired them in the 1970s and '80s through foreclosures and property abandonment, according to HPD spokesman Eric Bederman. He said the city discontinued its practice of taking over abandoned property in the mid-'90s, but many vacant lots remain. Most GreenThumb community grounds are awarded on a temporary basis, in case the city gets interest from developers, Bederman said. But volunteers said that the prospect of seeing their space sold off to developers isn't enough to stop them from trying to make it greener — even if just for a little while. "We have a four-year agreement, but if that lot is sold then we'll have to move on to another space," said local Joshua Hakimi, 46, who landscapes and tends to the plants at St. Nicholas Miracle Garden every Sunday. Organizers encourage Harlem residents to reach out if there's a lot nearby they want to tackle. For more information, go to the 596 Acres website.